The use of palm oil in food products has attracted the concern of environmental activist groups; the high oil yield of the trees has encouraged wider cultivation, leading to the clearing of forests in parts of Indonesia to make space for oil-palm monoculture. This has resulted in significant acreage losses of the natural habitat of the three surviving species of orangutan. One species in particular, the Sumatran orangutan, has been listed as critically endangered. In 2004, an industry group called the Roundtable on Sustainable Palm Oil was formed to work with the palm oil industry to address these concerns. Additionally, in 1992, in response to concerns about deforestation, the Government of Malaysia pledged to limit the expansion of palm oil plantations by retaining a minimum of half the nation’s land as forest cover. 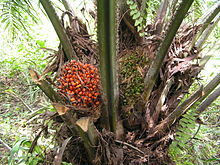 Palm oil became a highly sought-after commodity by British traders, for use as an industrial lubricant for machinery during Britain’s Industrial Revolution. Palm oil formed the basis of soap products, such as Lever Brothers‘ (now Unilever) “Sunlight” soap, and the American Palmolive brand. Red palm oil is rich in carotenes, such as alpha-carotene, beta-carotene and lycopene, which give it a characteristic dark red color. However, palm oil that has been refined, bleached and deodorized from crude palm oil (called “RBD palm oil”) does not contain carotenes. After milling, various palm oil products are made using refining processes. First is fractionation, with crystallization and separation processes to obtain solid (stearin), and liquid (olein) fractions. Then melting and degumming removes impurities. Then the oil is filtered and bleached. Physical refining[clarification needed] removes smells and coloration to produce “refined, bleached and deodorized palm oil” (RBDPO) and free fatty acids,[clarification needed] which are used in the manufacture of soaps, washing powder and other products. RBDPO is the basic palm oil product sold on the world’s commodity markets. Many companies fractionate it further to produce palm oil for cooking oil, or process it into other products. Palm oil is used to produce both methyl ester and hydrodeoxygenated biodiesel. Palm oil methyl ester is created through a process called transesterification. Palm oil biodiesel is often blended with other fuels to create palm oil biodiesel blends. Palm oil biodiesel meets the European EN 14214 standard for biodiesels. Hydrodeoxygenated biodiesel is produced by direct hydrogenolysis of the fat into alkanes and propane. The world’s largest palm oil biodiesel plant is the €550 million Finnish-operated Neste Oil biodiesel plant in Singapore, which opened in 2011 with a capacity of 800,000 tons per year and produces hydrodeoxygenated NEXBTL biodiesel from palm oil imported from Malaysia and Indonesia. Indonesia is the world’s largest producer of palm oil, surpassing Malaysia in 2006, producing more than 20.9 million tonnes. Indonesia expects to double production by the end of 2030. At the end of 2010, 60% of the output was exported in the form of crude palm oil. FAO data show production increased by over 400% between 1994 and 2004, to over 8.66 million metric tonnes. Thailand is the world’s third largest producer of crude palm oil, producing approximately two million tonnes per year, or 1.2% of global output. Nearly all of Thai production is consumed locally. Almost 85% of palm plantations and extraction mills are in south Thailand. At year-end 2016, 4.7 to 5.8 million rai were planted in oil palms, employing 300,000 farmers, mostly on small landholdings of 20 rai. ASEAN as a region accounts for 52.5 million tonnes of palm oil production, about 85% of the world total and more than 90% of global exports. Indonesia accounts for 52.2% of world exports. Malaysian exports total 37.9%. The biggest consumers of palm oil are India, the European Union, and China, with the three consuming nearly 50% of world exports. Thailand’s Department of Internal Trade (DIT) usually sets the price of crude palm oil and refined palm oil. Thai farmers have a relatively low yield compared to those in Malaysia and Indonesia. Thai palm oil crops yield 4–17% oil compared to around 20% in competing countries. In addition, Indonesian and Malaysian oil palm plantations are 10 times the size of Thai plantations. 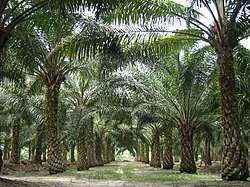 In the 1960s, about 18,000 hectares (69 sq mi) were planted with palm. Colombia has now become the largest palm oil producer in the Americas, and 35% of its product is exported as biofuel. In 2006, the Colombian plantation owners’ association, Fedepalma, reported that oil palm cultivation was expanding to 1,000,000 hectares (3,900 sq mi). This expansion is being funded, in part, by the United States Agency for International Development to resettle disarmed paramilitary members on arable land, and by the Colombian government, which proposes to expand land use for exportable cash crops to 7,000,000 hectares (27,000 sq mi) by 2020, including oil palms. Fedepalma states that its members are following sustainable guidelines. Palm is native to the wetlands of western Africa, and south Benin already hosts many palm plantations. Its ‘Agricultural Revival Programme’ has identified many thousands of hectares of land as suitable for new oil palm export plantations. In spite of the economic benefits, Non-governmental organisations (NGOs), such as Nature Tropicale, claim biofuels will compete with domestic food production in some existing prime agricultural sites. Other areas comprise peat land, whose drainage would have a deleterious environmental impact. They are also concerned genetically modified plants will be introduced into the region, jeopardizing the current premium paid for their non-GM crops. Kenya‘s domestic production of edible oils covers about a third of its annual demand, estimated at around 380,000 tonnes. The rest is imported at a cost of around US$140 million a year, making edible oil the country’s second most important import after petroleum. Since 1993 a new hybrid variety of cold-tolerant, high-yielding oil palm has been promoted by the Food and Agriculture Organization of the United Nations in western Kenya. As well as alleviating the country’s deficit of edible oils while providing an important cash crop, it is claimed to have environmental benefits in the region, because it does not compete against food crops or native vegetation and it provides stabilisation for the soil. While only 5% of the world’s vegetable oil farmland is used for palm plantations, palm cultivation produces 38% of the world’s total vegetable oil supply. In terms of oil yield, a palm plantation is 10 times more productive than soya bean and rapeseed cultivation because the palm fruit and kernel both provide usable oil. A 2018 study by the International Union for Conservation of Nature (IUCN) concluded that palm oil is “here to stay” as its cultivation is nine times more productive per unit of land compared with other vegetable oils. IUCN maintains that replacing palm oil with other vegetable oils would lead to greater land spoilage, adding to biodiversity deterioration. Palm oil growers who produce Certified Sustainable Palm Oil have been critical of the organization because, though they have met RSPO standards and assumed the costs associated with certification, the market demand for certified palm oil remains low. Low market demand has been attributed to the higher cost of Certified Sustainable Palm Oil, leading palm oil buyers to purchase cheaper non-certified palm oil. Palm oil is mostly fungible. In 2011, 12% of palm oil produced was certified “sustainable”, though only half of that had the RSPO label. Even with such a low proportion being certified, Greenpeace has argued that confectioners are avoiding responsibilities on sustainable palm oil, because it says that RSPO standards fall short of protecting rain forests and reducing greenhouse gases. Previously, palm oil could be listed as “vegetable fat” or “vegetable oil” on food labels in the European Union (EU). From December 2014, food packaging in the EU is no longer allowed to use the generic terms “vegetable fat” or “vegetable oil” in the ingredients list. 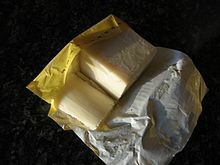 Food producers are required to list the specific type of vegetable fat used, including palm oil. Vegetable oils and fats can be grouped together in the ingredients list under the term “vegetable oils” or “vegetable fats” but this must be followed by the type of vegetable origin (e.g., palm, sunflower, or rapeseed) and the phrase “in varying proportions”. ^ a b c Nagendran, B.; Unnithan, U. R.; Choo, Y. M.; Sundram, Kalyana (2000). 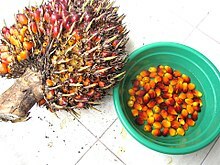 “Characteristics of red palm oil, a carotene- and vitamin E–rich refined oil for food uses”. Food and Nutrition Bulletin. 21 (2): 77–82. doi:10.1177/156482650002100213. ^ “FAO data – dimension-member – Oil, palm fruit”. ref.data.fao.org. Retrieved 17 August 2018. ^ Behrman, E. J.; Gopalan, Venkat (2005). William M. Scovell (ed.). “Cholesterol and Plants” (PDF). Journal of Chemical Education. 82 (12): 1791. Bibcode:2005JChEd..82.1791B. doi:10.1021/ed082p1791. Archived (PDF) from the original on 21 October 2012. ^ “Palm Oil Continues to Dominate Global Consumption in 2006/07” (PDF) (Press release). United States Department of Agriculture. June 2006. Archived from the original (PDF) on 19 October 2012. Retrieved 22 September 2009. ^ Che Man, YB; Liu, J.L. ; Jamilah, B.; Rahman, R. Abdul (1999). “Quality changes of RBD palm olein, soybean oil and their blends during deep-fat frying”. Journal of Food Lipids. 6 (3): 181–193. doi:10.1111/j.1745-4522.1999.tb00142.x. ^ Matthäus, Bertrand (2007). “Use of palm oil for frying in comparison with other high-stability oils”. European Journal of Lipid Science and Technology. 109 (4): 400–409. doi:10.1002/ejlt.200600294. ^ a b Raghu, Anuradha (17 May 2017). “We Each Consume 17 Pounds of Palm Oil a Year”. Bloomberg News. Archived from the original on 17 May 2017. Retrieved 22 May 2017. ^ “Deforestation”. www.sustainablepalmoil.org. Archived from the original on 17 August 2016. Retrieved 15 June 2016. ^ a b Natasha Gilbert (4 July 2012). “Palm-oil boom raises conservation concerns: Industry urged towards sustainable farming practices as rising demand drives deforestation”. Nature. 487 (7405): 14–15. doi:10.1038/487014a. PMID 22763524. Archived from the original on 7 July 2012. ^ a b Morales, Alex (18 November 2010). “Malaysia Has Little Room for Expanding Palm-Oil Production, Minister Says”. Bloomberg. Archived from the original on 12 September 2012. Retrieved 1 March 2013. ^ Scott-Thomas, Caroline (17 September 2012). “French firms urged to back away from ‘no palm oil’ label claims”. Foodnavigator. Archived from the original on 12 March 2013. Retrieved 7 March 2013. ^ Obahiagbon, F.I. (2012). “A Review: Aspects of the African Oil Palm (Elaeis guineesis Jacq. )” (PDF). American Journal of Biochemistry and Molecular Biology. 2 (3): 1–14. doi:10.3923/ajbmb.2012.106.119. Archived (PDF) from the original on 16 January 2013. Retrieved 30 August 2012. ^ “British Colonial Policies and the Oil Palm Industry in the Niger Delta Region of Nigeria, 1900–1960” (PDF). African Study Monographs. 21 (1): 19–33. 2000. Archived (PDF) from the original on 16 January 2013. ^ Bellis, Mary. “The History of Soaps and Detergents”. About.com. In 1864, Caleb Johnson founded a soap company called B.J. Johnson Soap Co., in Milwaukee. In 1898, this company introduced a soap made of palm and olive oils, called Palmolive. ^ Ahsan H, Ahad A, Siddiqui WA (2015). “A review of characterization of tocotrienols from plant oils and foods”. J Chem Biol. 8 (2): 45–59. doi:10.1007/s12154-014-0127-8. PMC 4392014. PMID 25870713. ^ “Oil, vegetable, palm per 100 g; Fats and fatty acids”. Conde Nast for the USDA National Nutrient Database, Release SR-21. 2014. Archived from the original on 28 October 2016. Retrieved 28 October 2016. ^ Ng, M. H.; Choo, Y. M. (2016). “Improved Method for the Qualitative Analyses of Palm Oil Carotenes Using UPLC”. Journal of Chromatographic Science. 54 (4): 633–638. doi:10.1093/chromsci/bmv241. PMC 4885407. PMID 26941414. ^ “Palm oil products and the weekly shop”. BBC Panorama. 22 February 2010. Archived from the original on 25 February 2010. Retrieved 22 February 2010. ^ a b “Investment in Technology”. PT. Asianagro Agungjaya. Archived from the original on 17 December 2007. ^ “Palm Oil In The Food Supply: What You Should Know”. NPR.org. 25 July 2013. Retrieved 2 December 2018. ^ “Too much milk in Europe (Interview with Sprayfo)”. Deutsche Welle. 25 March 2017. ^ a b Rojas, Mauricio (3 August 2007). “Assessing the Engine Performance of Palm Oil Biodiesel”. Biodiesel Magazine. Archived from the original on 11 May 2013. Retrieved 25 February 2013. ^ Yahya, Yasmine (9 March 2011). “World’s Largest Biodiesel Plant Opens in Singapore”. The Jakarta Globe. Archived from the original on 26 June 2012. Retrieved 25 February 2013. ^ hermes (24 January 2018). “European ban on palm oil in biofuels upsets Jakarta, KL”. The Straits Times. ^ Wahyudi Soeriaatmadja; Trinna Leong (24 January 2018). “European ban on palm oil in biofuels upsets Jakarta, KL”. The Straits Times. Retrieved 23 November 2018. For Indonesia, 40% of its palm oil exports to Europe are converted into biofuels. Europe is Malaysia’s second-largest export market for palm oil, with 30% of it used for biodiesel. ^ Robert-Jan Bartunek; Alissa de Carbonnel (14 June 2018). “EU to phase out palm oil from transport fuel by 2030”. Reuters. Retrieved 23 November 2018. Half of the EU’s 6 billion euros ($7 billion) worth of palm oil imports are used for biodiesel, according to data from Copenhagen Economics. ^ Hans Spross (22 June 2018). “Does EU biofuel deal compromise the environment for trade with Southeast Asia?”. Deutsche Welle. Retrieved 23 November 2018. According to a 2015 study carried out on behalf of the European Commission, the production and use of palm oil biodiesel causes three times the carbon emissions of fossil diesel. ^ Choong, Meng Yew (27 March 2012). “Waste not the palm oil biomass”. The Star Online. Retrieved 25 February 2013. ^ “Global Palm Oil Market Overview – 2018 – IndexBox”. www.indexbox.io. Retrieved 17 August 2018. ^ Prokurat, Sergiusz (2013). “Palm oil – strategic source of renewable energy in Indonesia and Malaysia” (PDF). Journal of Modern Science: 425–443. Archived from the original (PDF) on 4 March 2016. ^ “P&G may build oleochemical plant to secure future supply”. The Jakarta Post. 24 May 2011. Archived from the original on 25 July 2012. Retrieved 15 June 2012. ^ Pakiam, Ranjeetha (3 January 2013). “Palm Oil Advances as Malaysia’s Export Tax May Boost Shipments”. Bloomberg. Archived from the original on 5 January 2013. Retrieved 29 January 2013. ^ “MPOB expects CPO production to increase to 19 million tonnes this year”. The Star Online. 15 January 2013. Archived from the original on 27 January 2013. Retrieved 29 January 2013. 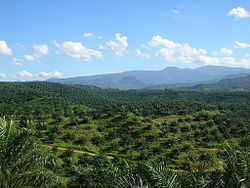 ^ “MALAYSIA: Stagnating Palm Oil Yields Impede Growth”. USDA Foreign Agricultural Service. 11 December 2012. Archived from the original on 18 February 2013. Retrieved 29 January 2013. ^ May, Choo Yuen (September 2012). “Malaysia: economic transformation advances oil palm industry”. American Oil Chemists’ Society. Archived from the original on 13 November 2012. Retrieved 29 January 2013. ^ Ayodele, Thompson (August 2010). “African Case Study: Palm Oil and Economic Development in Nigeria and Ghana; Recommendations for the World Bank’s 2010 Palm Oil Strategy” (PDF). Initiative For Public Policy Analysis. Archived from the original (PDF) on 22 April 2012. Retrieved 8 December 2011. ^ Ayodele, Thompson (15 October 2010). 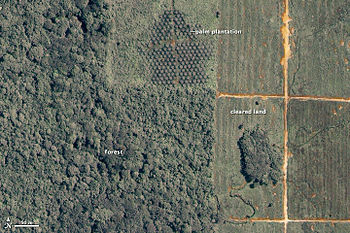 “The World Bank’s Palm Oil Mistake”. The New York Times. Archived from the original on 19 January 2018. Retrieved 8 December 2011. ^ Arunmas, Phusadee; Wipatayotin, Apinya (28 January 2018). “EU move fuelling unease among palm oil producers” (Spectrum). Bangkok Post. Retrieved 29 January 2018. ^ Bacon, David (18 July 2007). “Blood on the Palms: Afro-Colombians fight new plantations”. Archived from the original on 19 October 2012. See also “Unfulfilled Promises and Persistent Obstacles to the Realization of the Rights of Afro-Colombians,”  A Report on the Development of Ley 70 of 1993 by the Repoport Center for Human Rights and Justice, Univ. of Texas at Austin, Jul 2007. ^ Pazos, Flavio (3 August 2007). 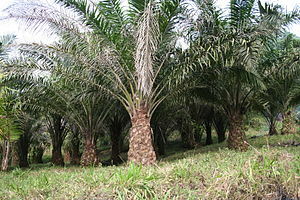 “Benin: Large scale oil palm plantations for agrofuel”. World Rainforest Movement. Archived from the original on 8 August 2014. ^ “Cameroon changes mind on Herakles palm oil project”. World Wildlife Fund. 21 June 2013. Archived from the original on 13 December 2013. Retrieved 23 May 2016. ^ “Hybrid oil palms bear fruit in western Kenya”. UN FAO. 24 November 2003. Archived from the original on 22 January 2015. ^ Budidarsono, Suseno; Dewi, Sonya; Sofiyuddin, Muhammad; Rahmanulloh, Arif. “Socio-Economic Impact Assessment of Palm Oil Production” (PDF). World Agroforestry Centre. Archived (PDF) from the original on 11 January 2014. Retrieved 30 January 2013. ^ Norwana, Awang Ali Bema Dayang; Kunjappan, Rejani (2011). “The local impacts of oil palm expansion in Malaysia” (PDF). cifor.org. Center for International Forestry Research. Archived (PDF) from the original on 22 June 2013. Retrieved 30 January 2013. ^ Ismail, Saidi Isham (9 November 2012). “Palm oil transforms economic landscape”. Business Times. Archived from the original on 12 November 2012. Retrieved 30 January 2013. ^ “Palm oil cultivation for biofuel blocks return of displaced people in Colombia” (PDF) (Press release). Internal Displacement Monitoring Centre. 5 November 2007. Archived from the original (PDF) on 27 November 2007. Retrieved 30 January 2013. ^ Colchester, Marcus; Jalong, Thomas; Meng Chuo, Wong (2 October 2012). “Free, Prior and Informed Consent in the Palm Oil Sector – Sarawak: IOI-Pelita and the community of Long Teran Kanan”. Forest Peoples Program. Archived from the original on 14 May 2013. Retrieved 30 January 2013. ^ ““Losing Ground” – report on indigenous communities and oil palm development from LifeMosaic, Sawit Watch and Friends of the Earth”. Forest Peoples Programme. 28 February 2008. Archived from the original on 14 May 2013. Retrieved 30 January 2013. ^ “Malaysia Plans High-Tech Card for Foreign Workers”. ABC News. 9 January 2014. Archived from the original on 13 January 2014. ^ “Malaysia rounds up thousands of migrant workers”. BBC News. 2 September 2013. Archived from the original on 5 September 2013. ^ Ibrahim, Ahmad (31 December 2012). “Felcra a success story in rural transformation”. New Straits Times. Archived from the original on 13 April 2013. Retrieved 7 February 2013. ^ Corley, R. H. V. (2009). “How much palm oil do we need?”. Environmental Science & Policy. 12 (2): 134–838. doi:10.1016/j.envsci.2008.10.011. ^ a b “Palm oil: Cooking the Climate”. Greenpeace. 8 November 2007. Archived from the original on 10 April 2010. Retrieved 30 January 2013. ^ “The bird communities of oil palm and rubber plantations in Thailand” (PDF). The Royal Society for the Protection of Birds (RSPB). Archived (PDF) from the original on 6 October 2016. Retrieved 4 October 2016. ^ “Palm oil threatening endangered species” (PDF). Center for Science in the Public Interest. May 2005. Archived (PDF) from the original on 17 September 2012. ^ Shears, Richard (30 March 2012). “Hundreds of orangutans killed in north Indonesian forest fires deliberately started by palm oil firms”. Daily Mail. London. Archived from the original on 20 April 2013. Retrieved 1 April 2012. ^ “Camera catches bulldozer destroying Sumatra tiger forest”. World Wildlife Fund. 12 October 2010. Archived from the original on 16 January 2013. Retrieved 30 January 2013. ^ a b Foster, Joanna M. (1 May 2012). “A Grim Portrait of Palm Oil Emissions”. The New York Times. Archived from the original on 16 January 2013. Retrieved 30 January 2013. ^ Yui, Sahoko; Yeh, Sonia (1 December 2013). “Land use change emissions from oil palm expansion in Pará, Brazil depend on proper policy enforcement on deforested lands”. Environmental Research Letters. 8 (4): 044031. doi:10.1088/1748-9326/8/4/044031. ISSN 1748-9326. ^ “Researchers warn against high emissions from oil palm expansion in Brazil”. phys.org. 13 November 2013. Retrieved 10 April 2019. ^ a b Rosenthal, Elisabeth (31 January 2007). “Once a Dream Fuel, Palm Oil May Be an Eco-Nightmare”. The New York Times. Archived from the original on 9 September 2017. Retrieved 30 January 2013. ^ Adnan, Hanim (28 March 2011). “A shot in the arm for CSPO”. The Star Online. Archived from the original on 19 August 2012. Retrieved 16 October 2012. ^ Andre, Pachter (12 October 2007). “Greenpeace Opposing Neste Palm-Based Biodiesel”. Epoch Times. Archived from the original on 12 November 2007. Retrieved 2 December 2007. ^ Fargione, Joseph; Hill, Jason; Tilman, David; Polasky, Stephen; Hawthorne, Peter (7 February 2008). “Land Clearing and the Biofuel Carbon Debt”. Science. 319 (5867): 1235–1238. Bibcode:2008Sci…319.1235F. doi:10.1126/science.1152747. PMID 18258862. Archived from the original on 28 May 2011. ^ a b Spinks, Rosie J (17 December 2014). “Why does palm oil still dominate the supermarket shelves?”. The Guardian. Archived from the original on 4 December 2016. Retrieved 7 December 2016. ^ “Oil palms need one-ninth of land used by other vegetable oil crops”. Jakarta Post. 6 February 2019. Retrieved 7 February 2019. ^ Meijaard, E; et al. (2018). Oil palm and biodiversity. A situation analysis by the IUCN Oil Palm Task Force (PDF) (PDF ed.). Gland: IUCN Oil Palm Task Force. ISBN 978-2-8317-1910-8. Retrieved 7 February 2019. ^ a b c d Browne, Pete (6 November 2009). “Defining ‘Sustainable’ Palm Oil Production”. The New York Times. Archived from the original on 12 May 2013. Retrieved 16 February 2013. ^ a b c d e Gunasegaran, P. (8 October 2011). “The beginning of the end for RSPO?”. The Star Online. Archived from the original on 13 April 2013. Retrieved 16 February 2013. ^ a b c Yulisman, Linda (4 June 2011). “RSPO trademark, not much gain for growers: Gapki”. The Jakarta Post. Archived from the original on 15 May 2013. Retrieved 16 February 2013. ^ Watson, Elaine (5 October 2012). “WWF: Industry should buy into GreenPalm today, or it will struggle to source fully traceable sustainable palm oil tomorrow”. Foodnavigator. Archived from the original on 7 November 2012. Retrieved 22 February 2013. ^ a b “What is Green Palm?”. Green Palm. Archived from the original on 3 October 2016. Retrieved 4 October 2016. ^ a b Diet Nutrition and the Prevention of Chronic Diseases (PDF). World Health Organization (Report). 2003. p. 82,88. Archived from the original (PDF) on 21 September 2012. Retrieved 13 February 2013. ^ “The other oil spill”. The Economist. 24 June 2010. Archived from the original on 9 February 2013. Retrieved 12 February 2013. ^ Bradsher, Keith (19 January 2008). “A New, Global Oil Quandary: Costly Fuel Means Costly Calories”. The New York Times. Archived from the original on 1 January 2015. Retrieved 12 February 2013. ^ Mancini, A; Imperlini, E; Nigro, E; Montagnese, C; Daniele, A; Orrù, S; Buono, P (2015). “Biological and Nutritional Properties of Palm Oil and Palmitic Acid: Effects on Health”. Molecules. 20 (9): 17339–61. doi:10.3390/molecules200917339. PMC 6331788. PMID 26393565. ^ a b Mozaffarian, D; Clarke, R (2009). “Quantitative effects on cardiovascular risk factors and coronary heart disease risk of replacing partially hydrogenated vegetable oils with other fats and oils” (PDF). European Journal of Clinical Nutrition. 63 Suppl 2: S22–33. doi:10.1038/sj.ejcn.1602976. PMID 19424216.